Little girls love playing with dolls, especially if she has a place for her doll to live. Barbie wooden dollhouses make perfect homes for your children’s dolls. They’re sturdy and carefully constructed to fit most fashion dolls (including Barbies and Bratz), allowing your kids to spend hours engaged in imaginative play. Here we will discuss some of the options you and your kids have for Barbie dollhouses. Kidkraft Designer Dollhouse: This house is perfect for any girl with a modern sense of style. This brightly-colored, trendy dollhouse includes three levels that can be accessed by two fashionably curved staircases. Eleven pieces of furniture are included, all of which match the house’s funky and colorful theme. Kidkraft My Dreamy Dollhouse: If your daughter leans more towards the romantic than the trendy, she’ll fall in love with this picturesque dollhouse. This three story house comes complete with fourteen pieces of furniture and an elevator to take Barbie to each floor. The piano even plays music and the lamp lights up for added realism and fun. Teamson Kids Dollhouses: Any child who dreams of being a world traveler will get a taste of big-city life with Teamson’s dollhouses. These gorgeous wooden houses are based on three of the world’s most popular cities: New York, London, and Paris. 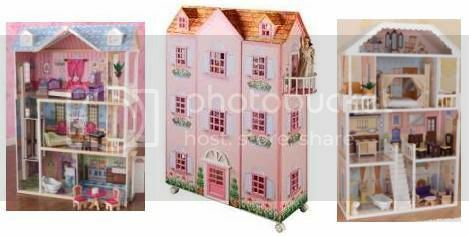 All three dollhouses are three stories tall and include furniture that matches the color and theme of the house. These dollhouses come with lockable wheels, allowing you to easily move them. Kidkraft So Chic Dollhouse: The So Chic Dollhouse gives a new spin to the traditional dollhouse. This house is open on all four sides, providing even more room to play. Its simple construction allows for tons of room for furniture. The house has three floors, ten rooms, a pink roof and matching pink staircases. With 45 pieces of furniture included, your child can decorate and play to her heart’s content. Kidkraft Majestic Mansion Dollhouse: If you really want to go all out, the Majestic Mansion Dollhouse is just as impressive as its name suggests. This enormous house includes four levels, eight rooms, 33 pieces of furniture, a gliding elevator, and even a garage with doors that open and shut. Kidkraft Savannah Dollhouse: Elegance is the name of the game with this finely crafted, award-winning dollhouse. It’s designed to look like a southern mansion and includes three stories, six rooms, a staircase that takes Barbie to the kitchen and dining room, thirteen pieces of furniture, and outdoor balcony. Each of these dollhouses is unique, but they have some important similarities. They all include large doors and windows that give kids easy access to all parts of the house. They’re also big enough that multiple children can play at the same time. All of these houses are made of wood and are sturdy enough to stand up to regular play. Finally, each of these houses gives your child a place to play with the dolls she loves. These heirloom-quality dollhouses will look beautiful in any home and are sure to be treasured by any little girl who has one. Give a kid a toy with wheels and you’re in for a day of fun. This is especially true if Morgan Cycle Wagons are involved. Kids love being able to pull themselves and their toys around in these cute little wagons. Whether your child wants to bring a teddy bear with them to the park or if you need a place to stow a sleepy toddler, there’s a Morgan Cycle Wagon that’s perfect for what you want to do. Does your child have a stuffed animal friend that she brings with her everywhere? A tot wagon is a great way to give her a method to transport her toys. These wagons are sized perfectly for a toddler’s hand and can be used both indoors and outdoors. They’re even a great size for gift baskets, making for an adorable way to present a gift at a baby shower or birthday party. Bigger children won’t be left out of the fun with Morgan Cycle Wagons that are big enough for them. These wagons are designed to be used by kids age four and up. They’re a great way to transport toys, picnic supplies, or even a younger sibling. For the most luxurious wagon experience available, the Morgan Cycle Coach Wagon can transport two children at a time. Any toy that gets played with often is bound to experience some rough play. These wagons are built for this eventuality. They’re formed out of tough metal that can handle the bumps of a busy afternoon of play. Durable wheels can deal with a variety of surfaces, and a solid handhold makes sure that even small hands can get a firm grip. There’s no need to worry about harmful chemicals used in the wagon’s construction – each one is coated with non-toxic paint. Let’s face it – girls will probably look for something a little different in a wagon than what a boy would want. No matter what your child’s tastes are, there’s a wagon to suit them. Tot wagons come in red or pink, but you’ll also be able to choose from some cute designs like flames, stars or flowers. The coach wagon looks stately with a deep green coating and black seating. Finally, any little girl will feel like a princess with a Bella Wagon in soft pink or rich lavender. When a child has a way to carry their belongings with them they’ll be able to go farther and do more. The choices in size, color, and shape all come together to make these wagons fit the tastes of any child. They’re safe and sturdy, so no matter what adventures your kids go on you can be sure their Morgan Cycle Wagon will still be rolling along behind. Watching your child grow from a tiny newborn to an adventurous toddler is a magical experience. As your children grow older they begin to want to explore the world around them. One of the ways you can help them explore is by providing them with a Radio Flyer Tricycle. These tricycles are a safe, fun way to help kids learn more about their world as well as build physical skills that will help them as they grow older. What Makes These Trikes Special? Learning to ride a bicycle is a huge part of every child’s life, but you can’t expect a toddler to be able to ride a two-wheeler. That’s why Radio Flyer Tricycles are a perfect in-between step. These trikes are built to be sturdy and safe. Because there is one wheel in the front and two wheels in the back your child won’t have to worry about balance. Instead, they can just sit down and go. 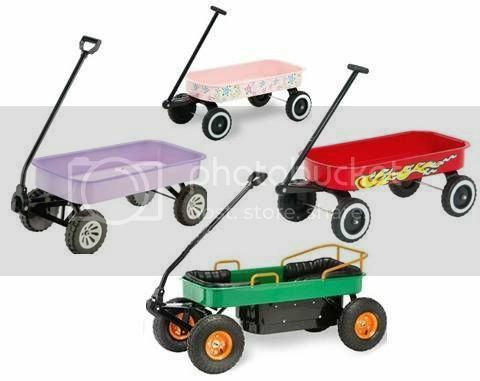 There are lots of tricycles out there, but Radio Flyer Trikes stand out because of their high quality construction and unique design. The Radio Flyer brand has been known for generations for creating wagons that last. This dedication to craftsmanship is carried through into the care with which they make their trikes. What Can My Child Learn From a Radio Flyer Trike? Girls and boys who learn to ride a tricycle have the ability to travel a little bit further and a little bit faster than what they can do on their own two feet. This opens up their world enough for them to learn about things outside their own backyard. However, they won’t be able to reach speeds that could become dangerous. Many Radio Flyer Tricycles have options like push handles that allow moms and dads to stay in contact with their kids while they learn to ride. Most toddlers and young children have trouble keeping still. Riding around on a tricycle is a great way for them to expend energy. Encouraging your kids to play actively helps them to learn that moving is fun. This instills habits that will help keep them healthy for the rest of their lives. Who Can Use a Radio Flyer Trike? 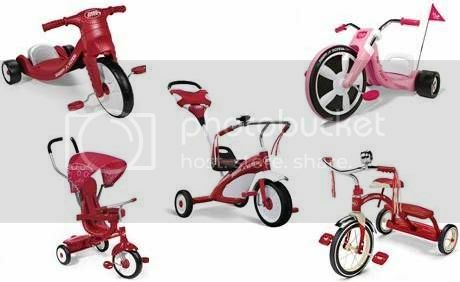 There’s a huge range of Radio Flyer Tricycles available. While there are plenty of tricycles that suit kids aged two to five, there’s no reason younger kids can’t get in on the fun. The 4-in-1 trike is perfect for any new mom. It can convert from a stroller to a steering trike, then to a learn to ride trike, and finally to a standard tricycle. Your child can enjoy this trike from 9 months to five years old, giving you years of fun out of a single machine. Helping your children grow into adults means giving them opportunities to explore independently. For many kids, a tricycle is the first step on this road to independence. Radio Flyer Tricycles are a sure-fire way to keep your kids safe and happy as they begin to explore the world around them. Getting their first bicycle is a major event in the life of any child, especially if the bicycle is unique and matches your child’s personality. Morgan Cycle Cruiser Bicycles are just that – a unique way to introduce your child to the world of bicycling. These bikes help kids start to grow up in a number of different ways. Until they get their first set of wheels, children are limited to moving at the speed their legs can take them. While this helps keep them safe, it’s also important for kids to get a sense of their ability to move on their own. That’s where Morgan Cycle Cruiser Bicycles come in. 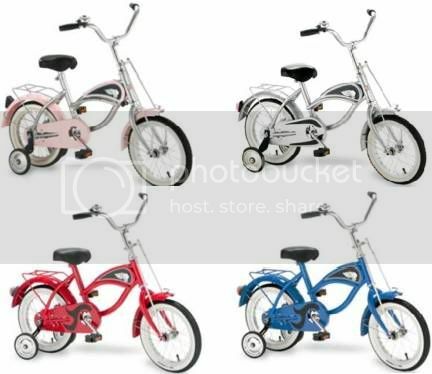 These bikes feature 14” wheels – perfect for three to six year olds. This is the age where it’s important to encourage kids to explore the world a little more on their own. Taking a trip to the park with mom and dad become a whole new adventure when a child pedals there themselves. If you’re worried that your kids may be spending too much time in front of the TV, a bicycle is a great encouragement to go outside to play. Boys and girls love to race around on bikes, and while doing so they improve their strength and coordination. Morgan Cycle Cruiser Bicycles come with training wheels, so while your kids are playing they’re also safely learning how to ride a two-wheeled bike. This is a great way to promote an active hobby that they can engage in for the rest of their lives. Knowledge of road safety is an extremely important thing to pass onto your children. Teaching your children how to be safe on the road while on a bike will help them grasp the concepts they need to know. Things like watching and listening for cars, riding on the correct side of the road, and the importance of helmets are all easy to learn when on a bike. The makers of Morgan Cycle Cruiser Bicycles care as much about your children’s safety as you do. Their bikes are solidly made with durable wheels and non-toxic coatings. One of the most fun things about Morgan Cycle Cruiser Bicycles is how fun they look. They’re modeled after classic mid-century beach cruisers, giving them a unique and interesting shape that is sure to turn a few heads. Your child will have a choice between pink, blue, silver, and red coatings, allowing them to choose the color that they like the best. There’s no need to present your child with a hum-drum bike as their first set of wheels. Morgan Cycle Cruiser Bicycles are unique and fun. Not only do they look great, but there’s also no end to the ways they can help your child change and grow. Can you think of a better way to spend an afternoon with your kids than outside in the backyard? On a beautiful sunny day your yard can become a magical place. With kid-sized Kidkraft Outdoor Furniture your children will be able to have their own place to sit back and enjoy the outdoors. Mom and dad may love to lounge in an Adirondack chair, but for many boys and girls these seats are too big to be comfortable. That’s why Kidkraft offers a range of carefully made Adirondack chairs that are perfectly proportioned to your children’s height. Your kids will love spending time with you on the patio in these classically shaped chairs, and they’ll be comfortable while they do so. Best of all, these chairs are built to last, meaning they’ll still be there when it’s time for grandkids to visit. It’s no secret that spending too much time out in the sun can be dangerous, especially for children’s sensitive skin. Using sun block is a good start, but giving your kids a place to sit in the shade is a great way to make sure they’re protected from the sun’s rays. Kidkraft Outdoor Furniture features several pieces that come with an umbrella built in. These include sturdy picnic tables and chairs as well as a luxurious chaise lounge. By adding a table or chair with an umbrella to your backyard you’ll give your kids a place to rest comfortably and safely during those long summer days. What better way to end a perfect summer day than with a backyard barbeque? The smell of hot dogs and hamburgers will definitely bring your kids running (probably with a friend or two in tow). When you’re cooking outside it can be difficult to find seating for everyone. Asking your kids to eat while standing up can lead to some messy mustard-related disasters, so it’s important to have a sturdy place for kids to eat. Kidkraft picnic tables are the perfect answer to your barbeque dilemmas. They’re perfectly sized for kids to eat at, making it easy to serve a delicious outdoor dinner to your family. All Kidkraft Outdoor Furniture is designed for outdoor use. They’re constructed out of sturdy, weather-resistant wood and are designed to stand up to everyday use. All Kidkraft furniture and toys have non-toxic finishes, so you can be sure that your kids are safe whenever they use them. Whether you’re hosting a rollicking backyard party or simply enjoying a cool breeze on the porch, Kidkraft Outdoor Furniture will give your children a special place to enjoy themselves. For sturdy, attractive furniture that’s sized perfectly for your children, there’s no better alternative. Kids love the feeling of zooming around on a set of wheels. Trikes, bikes, roller skates, scooters… the list goes on and on. Well, add a new form of transportation to that list – the Plasmart Plasmacar. This award-winning ride-on toy is the perfect way for children to move from point A to point B without making use of batteries, electricity, or anything else but their own power. The secret to the Plasmacar’s abilities is in the unique design of the front wheels. They’re set up in such a way that all a child has to do is turn the steering wheel. The forces of friction, inertia, and centrifugal force take over, bringing the rider up to speeds of almost six miles an hour. While this isn’t exactly the speed you’d see in a NASCAR race, it’s enough to give boys and girls a fun ride without putting them in any danger. How Does This Benefit My Children? The main benefit of these ride-on toys is that they get kids up and moving. It’s no secret that childhood obesity is on the rise, so anything that allows kids to use up some extra energy in a fun and safe way is a good thing. Fun is definitely the name of the game when it comes to these Plasmacars. One of the best things about them is that they’re so easy to use. All but the smallest kids will be able to grasp how they work, allowing a huge variety of kids to take part in the fun. Where Can These Plasmacars Go? If your child has a Plasmart Plasmacar, there’s a lot they can do with it. Plasmacars work best on a level surface, which makes them great for playing with in the driveway and around the outside of the house. Imagine inviting a few families over for a barbeque. You and the other parents can enjoy some time chatting over the grill while the kids have the time of their life zooming around in front of you. You don’t have to keep the cars at home, though. If there’s a park nearby, why not take a “drive” to it? A Plasmacar’s top speed allows your child to move a bit faster than he or she normally would, but not so fast that they could easily get out of sight. This allows your child a little more independence without putting him or her in any danger. The bright, cheerful colors that these cars are made with also help keep your child visible to you and anyone else nearby as well as letting them show off a little personality. Girls love the Pink and the Purple, boys love the Blue, the Yellow is a real attention-getter, and Red seems to be loved by both boys and girls. A Plasmart Plasmacar gives kids a whole new way to get from place to place using nothing but their own power. These cars are safe, sturdy, and so much fun for kids. They’ll have such a good time that you may start to wonder why they don’t make Plasmacars for adults!